Evergreen Nursery has an active recycling program. By recycling black plastic containers, greenwaste and paper generated from our operation, Evergreen Nursery is reducing its carbon footprint. 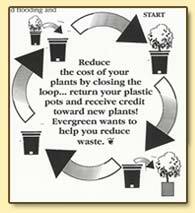 By giving credit to our customers for returning containers, Evergreen encourages consumer recycling. By accepting greenwaste from our customers, we are able to make our own soil products which reduces costs that get passed on as lower prices. As experts in zero runoff, Evergreen Nursery has received many compliments from agricultural agencies for our innovative desiltation basins and water saving techniques. Yard trimmings create wonderful soil products! 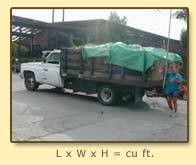 Our green waste recycling program is offered at 2 locations, Carmel Valley & Oceanside. Green waste recycling prices are determined by measurement and are doubled for Palm Trees, Yuccas, Pampas Grass, Bamboo and Succulents. Don't forget to bring us your Christmas trees (all decorations removed). Please call for current green waste recycling prices. Receive store credit for bringing in your used nursery containers. Credits are valid for one year and can be used on all products except for sod purchases. THE FINE PRINT: Store credits CANNOT be extended beyond one year, CANNOT be used for payment on any account, and CANNOT be replaced if lost. Must obtain credit at the register on the same day. Not valid for sod and gift certificate purchases.